Not much has been said about The Lord of the Rings here on the blog, the movies or the books. The last of the movies came out long before I started thunderstrokes, and although I’ve managed to work in a few scattered references here and there along the way, they are in no way sufficient to indicate the depth of admiration I have for them, the movies and the books. 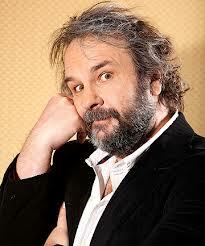 I am an unabashed fan of Peter Jackson’s trilogy of movies. Jackson did a better job of bringing Middle-earth to life, and of telling the story of Frodo and Sam, Aragorn, Gandalf and company, than I would have believed possible. The narrative was clear and compelling, the characters bold and nuanced, and the tale’s majestic scale and scope effectively replicated. Best of all, Jackson found a way to consistently give satisfactory visual form to Tolkien’s unbounded imaginings. Frodo as the book, and Sam as the movies. Yet for me, the films cannot begin to rival the books. At their best, Jackson’s movies play Sam to Tolkien’s Frodo, faithful and loyal followers to the hilt, but always subservient, always ancillary to the one charged with carrying out the original task. As Frodo would be the first to tell you, though, that is something special in itself, and renders the films deserving of all the bountiful praise they have received. I think I can honestly say no book, or series of books, has had the cumulative emotional impact on me that The Lord of the Rings (LOTR) has. Oh, all right, The Adventures of Huckleberry Finn did, but in a different way, for a different reason, which I will hopefully find the words to explain someday. I was fifteen, or sixteen, or maybe even seventeen when I discovered Tolkien’s magic place. By the time I finished reading LOTR, I was so completely and hopelessly attached to the characters, so utterly rooted to their world, my mind could not accept the fact that I was now being deprived of their continuing company. My forced departure from Middle-Earth was physically painful; I felt as though I were being punished unjustly for no crime greater than finishing the story. I grieved the sudden absence of Frodo’s band of noble heroes from my life like the death of a good friend. I was heartsick for weeks, suffering from intense feelings of separation and loneliness. I have no doubt that I would have been labeled as clinically depressed during that time, had anyone stopped to check. Like many others, when I heard that Jackson planned to take The Hobbit and turn that comparatively simple, linear story into first two films, and then three, I was mystified to say the least. Jackson had earned a long line of credit with me after making the first trilogy; I had to give him nearly all of it in one big withdrawal when he made that announcement. He explained the decision by saying that he wanted to incorporate material that wasn’t originally part of The Hobbit, but came instead from writing Tolkien did after Lord of the Rings. I couldn’t argue with him there; as someone who both read, and actually enjoyed, The Silmarillion, I was well aware of the truly vast expanse of material from which to draw. But I couldn’t recall how any of it might really serve to strengthen the story told in The Hobbit. Then again, it’s been close to thirty years since I’ve read any Tolkien, and so I couldn’t seriously consider myself a judge in the matter. So, I did the most practical thing possible under the circumstances, and took a wait-and-see attitude. Now, some ten years after the release of The Lord of the Rings: The Return of the King, the long wait is over and the seeing is one-third complete. And I can say that returning to Middle-Earth was a good thing, as represented by The Hobbit: An Unexpected Journey. Those of you expecting a full review of the film must be new to thunderstrokes. I love to write about movies, but I don’t love to write reviews. Suffice it to say that much of what made the previous trilogy great is present in this movie to varying degree. Purists will undoubtedly find no shortage of things to take issue with, but the main gripe they had with the Lord of the Rings films, namely, the scenes and moments from the books that were left out, can’t be one of them. After all, The Hobbit is a trilogy made by accretion, and not deletion. Personally, I have forgotten far too much to even pretend to be a purist, and I tried to experience the film on its own merits as much as possible. Where Jackson undeniably excels is in the authenticity of the fantasy world he conjures up for us, and his vision of Middle-Earth is as absorbingly realized as ever. He also has a knack for matching performers to characters, and in this film the additions of Martin Freeman as the younger version of Bilbo Baggins (the hobbit of the title), and Richard Armitage as Thorin Oakenshield (a dwarf king determined to reclaim his mountain realm from the dragon Smaug) elevate the film and help it sparkle. And then there’s Gollum, that depraved, tormented creature whose long and lonely grip on the one ring of power finally fails after five hundred years. 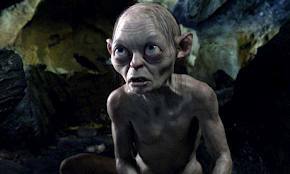 In LOTR, I think audiences were enthralled by Gollum because he was so life-like, but I think those films missed somewhat in bringing out the tremendous pathos Tolkien built in to the character. In The Hobbit, Gollum comes to life in a way that surpasses his portrayal in LOTR, and his true and complete wretchedness is fully brought home for the first time. His fully cleaved being, childlike and craven and even sweet on one hand, demented, conniving, and vicious on the other, and the madness that comes from constantly caroming between the two comes fully alive. In watching The Hobbit: An Unexpected Journey, it felt like I was watching the Gollum that Tolkien had introduced me too all those years ago. I can’t honestly recall ever thinking that while watching LOTR. The Hobbit: An Unexpected Journey ends just as the first film in LOTR does, with the heroes’ mountain destination finally in direct sight (Mt. Doom for Frodo and Sam, and The Lonely Mountain for Bilbo and company). But I think it would be a mistake to seek too many more parallels between the two. Despite Jackson’s considerable skill as a filmmaker and storyteller, I don’t think The Hobbit has much of a chance if the goal is to challenge the accomplishments of LOTR. In the end, the story’s simply not as grand; there’s just not as much at stake. 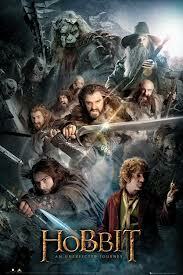 The Hobbit is a prelude to something greater. How can a prelude hope to surpass the thing it is destined to precede? That doesn’t mean The Hobbit films can’t be great, and still tell a wonderful story; I just think that in the end it must fall short of the masterwork in the same way that the book would have fallen short if it were written after The Lord of the Rings, instead of before. It would be better to look at The Hobbit as a story that stands on its own, free of as many direct contrasts to LOTR as possible. In that sense, I wonder if turning The Hobbit into a trilogy was the wisest move, since it inevitably encourages comparisons in what can never really be a fair fight. The Hobbit: An Unexpected Journey is a long film, longer than it really needs to be at almost three hours in length, though maybe not by all that much. 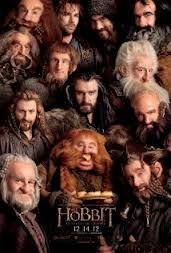 Some people have criticized the long beginning of the movie, in which thirteen dwarves arrive at Bilbo Baggins’ home in the Shire at the behest of Gandalf the wizard, and Bilbo’s role in the dwarves’ plan to reclaim their kingdom is slowly revealed. However, I am not among those people. I thought Jackson did a masterful job of deliberately, and entertainingly, setting up the narrative. Furthermore, I thought there was an important, and perfectly justifiable, reason for being so deliberate. If you think about the task before him, Jackson has thirteen dwarves appearing almost simultaneously in the story, each of whom is a unique character, and each of whom matters. None of these dwarves are named Sleepy, Sneezy, Dopey, or Doc, so you’ve got to find some way to differentiate them in the mind of the audience. Otherwise, you end up trying to tell a story about these characters, but the audience can only reliably identify Bilbo, Gandalf, and probably the dwarf-king Thorin Oakenshield. Not the best for establishing a deep, emotional bond with the characters. The Hobbit does a good job of distinguishing the dwarves through visual cues (hair, age, girth), but my bet is that the time spent allowing us to get to know them by watching them behave in contrast with each other will pay off in the long run (and remember, the long run in this case is three movies, not one). In fact, I wish more directors understood the importance of being deliberate when establishing a film’s beginning. Often it appears that directors rush the exposition to get to the action of the story. Perhaps this is because the director is afraid of losing the audience’s interest, or perhaps they don’t trust their own skill in being deliberate. Or maybe they don’t trust the story enough to let it find its own pace. No matter how you look at it, though, it demonstrates a lack of faith in something: audience, self, or story. I actually took Jackson’s handling of the film’s beginning as a sign of strength, and of confidence in the audience, himself, and in the story he’s telling. My problem with the film’s length actually comes from the opposite extreme. For me, it was in some of the action sequences where the movie most needed trimming. We tend to think of action scenes as adding energy and excitement to a film, but when those scenes are needlessly long, or repetitive, or hopelessly hyperbolic, it actually flattens a film, and bleeds momentum and energy from it. I first noticed this tendency in the mountain crossing scene, during the mountain giants’ battle. It recurred, much more palpably, in the scene where the group is cornered by the ultra-orc Azog and his pack of wargs. But by far the worst offender is the scene in which the dwarves and Gandalf escape from the goblin king. Somehow, Jackson manages to score the trifecta of needlessly long, repetitive and hopelessly hyperbolic in the same sequence (of course, those of us who have seen his version of King Kong knew he was certainly capable of such a feat). How long did we have to watch our heroes running along section after section of rickety wooden scaffolding while being swarmed by goblins over and over and over? There were at least three minutes, which can be an eternity for an action sequence, in which no meaningful information was transferred to the audience. The scene consists almost entirely of a repeated series of shots of them running, hacking, slicing, jumping, swinging, and more running. None of which increased the drama or the suspense, nor did it add any real sense of danger; in fact, it had the opposite effect. No, the real sense of danger during that part of the movie was happening far below in the depths of the mountain, in the tense, three-way duel of wits between Bilbo and Gollums’ two selves. In comparison, Gandalf and the dwarves’ escape from the goblin hordes was dull and uninvolving, tediously long and almost unbearably outlandish. It reminded me of the worst of Steven Spielberg. The escape from the goblins in The Hobbit might not have been Kingdom of the Crystal Skull bad, but it was easily Jurassic Park II bad. In the end, trimming five minutes of extraneous action could have made a significant difference, and prevented the film from floundering at times when it should have been ripping along. To me, the question is why did Jackson feel the need to goose up these action sequences to such ridiculous heights? This was not a characteristic of the LOTR trilogy, where he showed unerring restraint, and the action was always focused, and the effect on the audience was often sheer exhilaration. I can’t recall feeling like he sacrificed narrative for unfocused action in any of those movies. Why now, with The Hobbit? It is possible that Jackson was not totally confident in his decision to turn The Hobbit into three films, and felt some self-induced pressure to overindulge the action in order to support its length, or to justify his decision? How else to explain such a sudden lapse in storytelling precision? Whatever the reason, this sequence in particular seems to undercut the apparent confidence with which the director began the film. Side-note to Mr. Jackson: if this is in fact the case, turn back, sir, while there’s still time. Forsake the shabby and easy path of action for action’s sake, and trust the narrative. Your storytelling skills are strong enough to compel an audience’s attention without resorting to mindless action and excessive embellishment. Gee, I hope he’s listening. The only other thing that bothered me slightly was the way Saruman was presented. 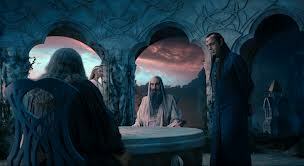 In this film, there’s a scene in Rivendell, home base of the elves, where most of the protectors of Middle-earth come together to discuss some strange occurrences. I believe this was an added scene not original to the book, which may partly explain the problem. Anyway, Saruman the white wizard is there, and Gandalf (still grey at this point, remember) and Elrond and Galadriel, leaders of the elves. A wizard by the name of Radagast the Brown has given proof to Gandalf of the return of these very bad creatures called necromancers, which would be an admittedly depressing, but very important, development. Saruman, however, unilaterally pooh-pooh’s the possibility, in spite of the evidence in front of him, and refuses to even discuss the implications. It’s enough to make the average person a little suspicious (okay, the average person already knows what he’s going to ultimately do), but any sense of misgiving with regard to Saruman’s reaction apparently flies right over the heads of three of the wisest people in Middle-earth. Sixty years later, it must still be flying right over their heads because early on in Frodo’s subsequent adventures in LOTR, we know Gandalf is going to innocently go see Saruman for advice, and he will still be summarily surprised when Saruman betrays him. Not quite sure how you convincingly skirt that little pothole, or should I say plot-hole. But that’s a very minor complaint in a film that otherwise does everything it can to be worthy of a place alongside the magnificent LOTR trilogy. Hopefully, Mr. Jackson can restrain the urge to gonzify those action scenes in the future, and otherwise sustain the level he’s attained with the next two films. If so, I think we will be thankful for this second trip to Middle-earth, and happy that it turned out to be as long as the first.